Look out Radon... We are on to you! Radon is a real problem for many parts of the country! Using a radon blocking liner is one way you can protect yourself against radon. Below is an infographic from PropertECO Ltd that you can visit here or read about it below. Radon is a radioactive gas that we can’t see, smell, or taste. Therefore, a special test kit is required to detect it. These are inexpensive and easy to order online. Radon comes from the rocks and soil found everywhere in the UK. The radon level in the air we breathe outside is very low, but can be higher inside buildings. 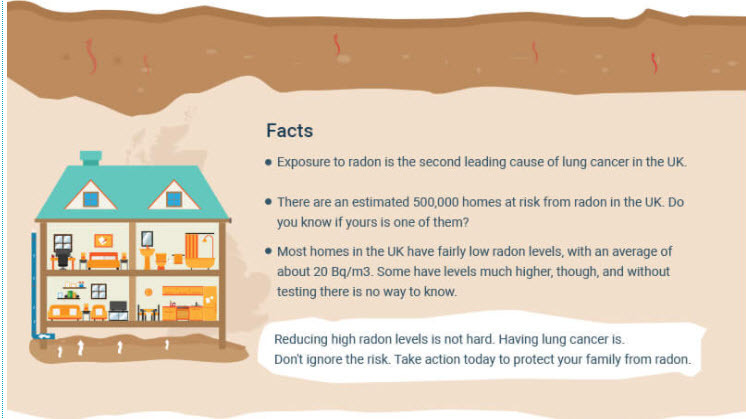 Radon is responsible for causing an estimated 1,100 deaths from lung cancer each year in the UK. We are all exposed to radiation – from natural and man-made resources. 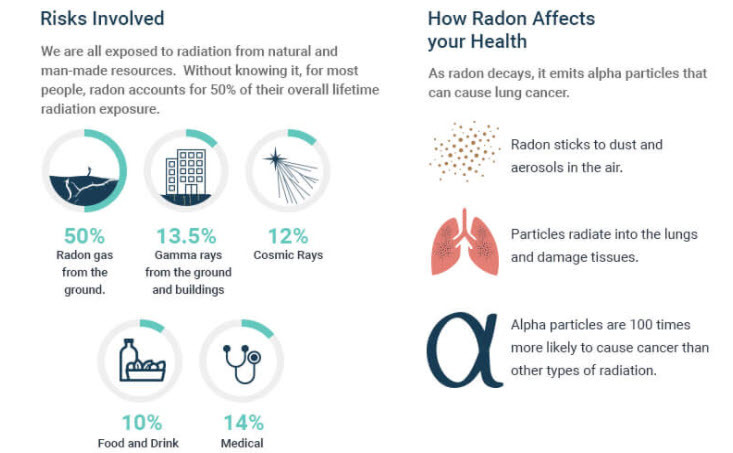 Without knowing it, for most people, radon accounts for 50% of their overall lifetime radiation exposure. – 50% Radon gas from the ground. As radon decays, it emits alpha particles that can cause lung cancer. – Radon sticks to dust and aerosols in the air. – Particles radiate into the lungs and damage tissues. – Alpha particles are 100 times more likely to cause cancer than other types of radiation. Radon increases the risk of lung cancer and the higher the radon, the greater the exposure and thus the greater the risk. 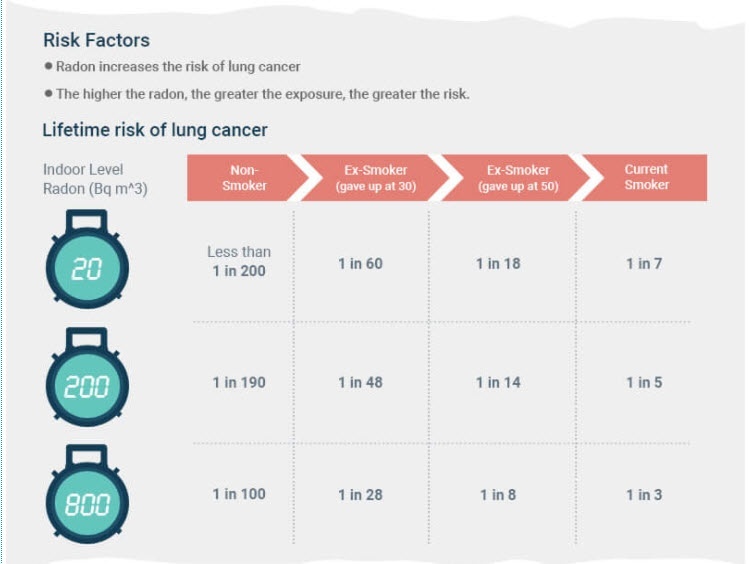 – The risk is greater for smokers and ex-smokers as there is a synergistic effect, however radon is the leading cause of lung cancer among non-smokers. – Smokers choose to smoke, despite knowing the risks. 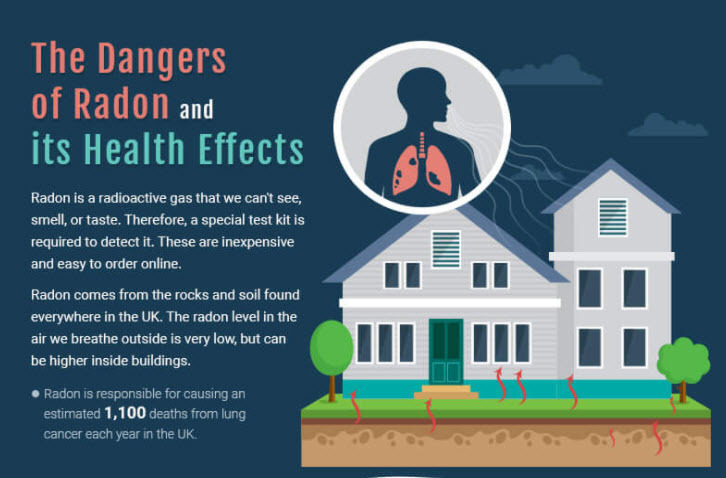 Nobody chooses to live in a building with high radon levels; most are unaware of the risks. – Radon comes from the ground, and enters a building via the surfaces in contact with the ground. 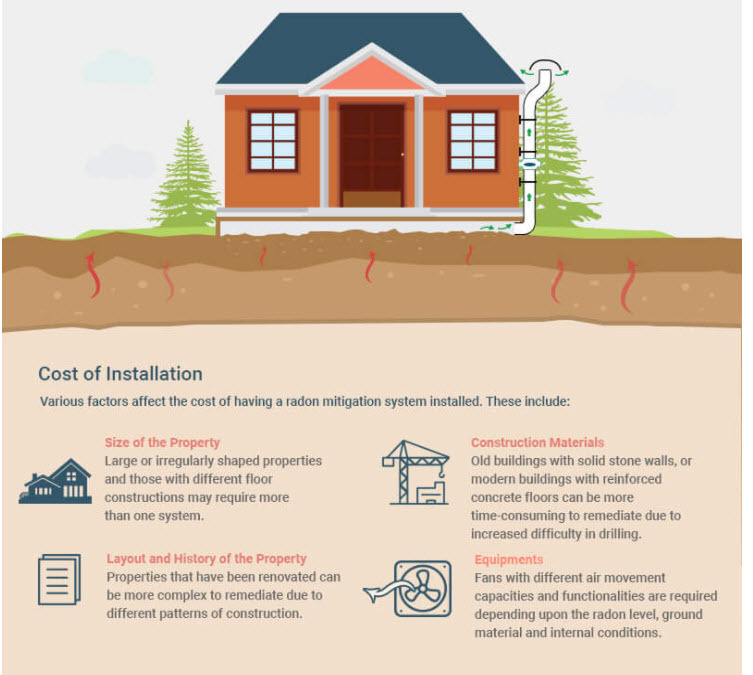 – Some radon will passively infiltrate into the building, for example through cracks in the foundations and gaps around pipes. Radon can also pass through certain materials, even those which provide an adequate barrier to water penetration. – The main mechanism through which radon enters a property is advection. This is the movement of the gas from the soil to the lowest point of pressure, which is usually inside the building. This means that the gas is being ‘sucked’ from the ground into the building, and the greater this pressure difference is, the faster the rate at which the gas is drawn inside. 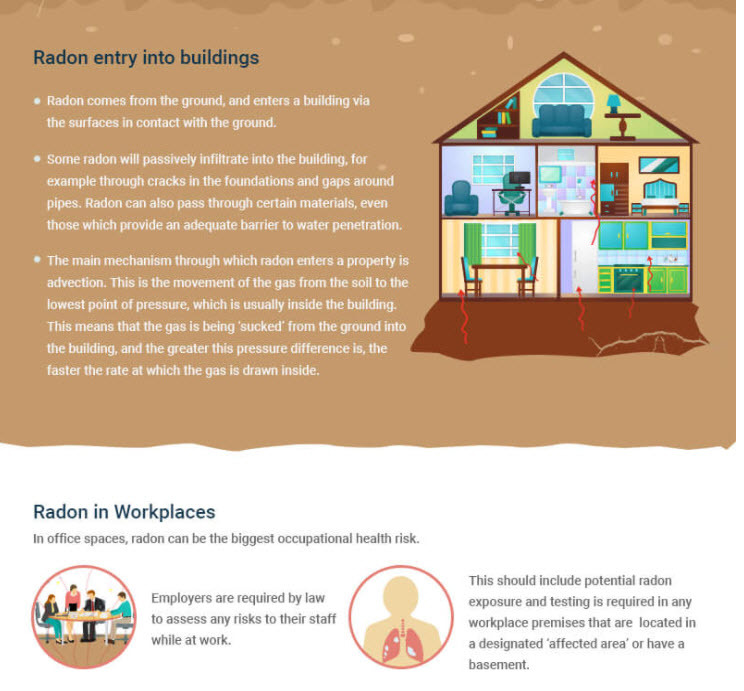 In office spaces, radon can be the biggest occupational health risk. – Employers are required by law to assess any risks to their staff while at work. – This should include potential radon exposure and testing is required in any workplace premises that are located in a designated ‘affected area’ or have a basement. 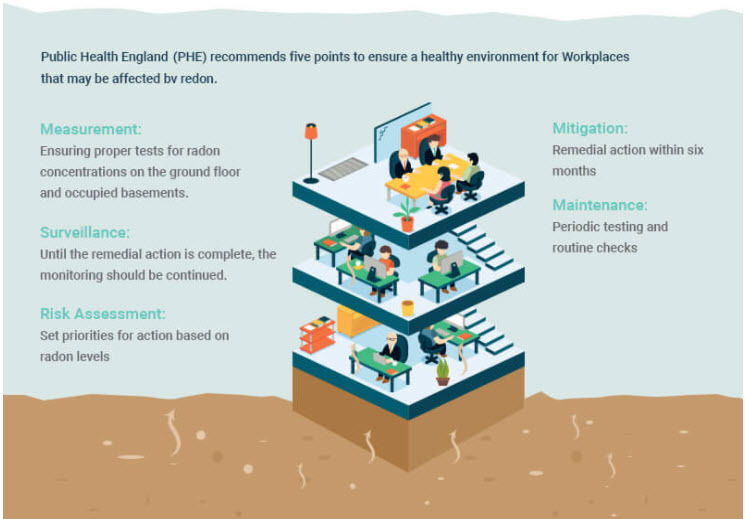 Public Health England (PHE) recommends five points to ensure a healthy environment for office premises near radon affected areas. – Measurement: Ensuring proper tests for radon concentrations on the ground floor and occupied basements. – Surveillance:Until the remedial action is complete, the monitoring should be continued. – Radon Sump. A radon sump is a small void created beneath a building, which acts as a collection point for the gas. Pipework and a fan are then installed to vent the gas safely away from the building. – Cellars and Basements. Cellars and basements can be more complex to remediate and a combination of techniques, including positive pressure, sumps and sometimes special membranes may be required. – Exposure to radon is the 2nd leading cause of lung cancer in the UK. 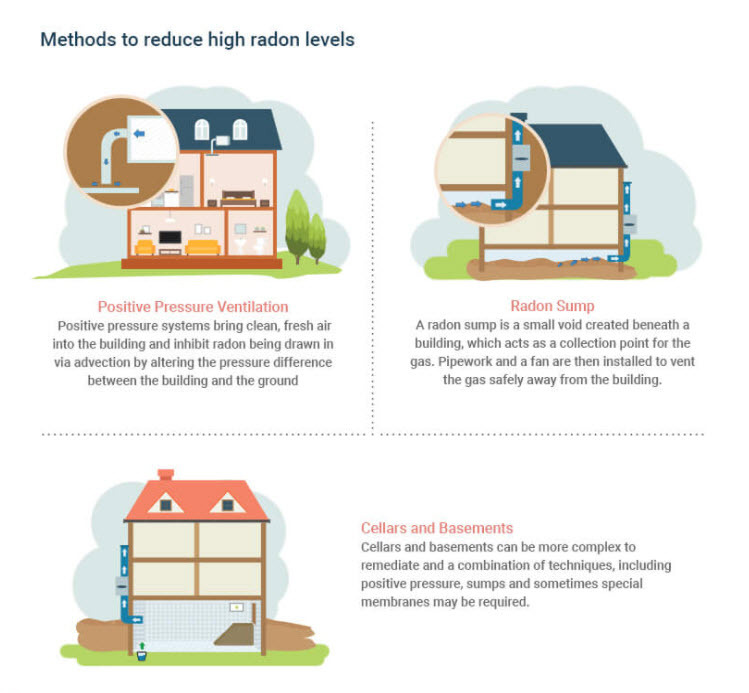 Do you know if you’re being exposed to high radon levels? It’s time you took action to find out.